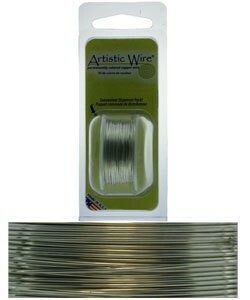 Artistic Wire is the most extensive line of permanently colored copper wire for jewelry and crafts. The wire has an exclusive enamel coating that is available in a high-shine metallic finish or in a matte finish. The coating is engineered to resist tarnishing, chipping and peeling. It will also stand up to coiling, spiral making, twisting, wrapping and other wire working techniques. You can form Artistic Wire easily into jewelry components such as chain maille, beaded chain, jump rings, gemstone settings and more. Use our wire range of tools including round nose pliers, chain nose pliers, hammers and anvils, jump ring makers, spiral makers, wire twisting tools, wire crinklers, wire rounders and more.